Hi, my name is Yeshe and I attend Lake Oswego Junior High. On June 9th, 2018, I participated for my first time in the annual Grand Floral Parade, part of Portland’s Rose Festival. 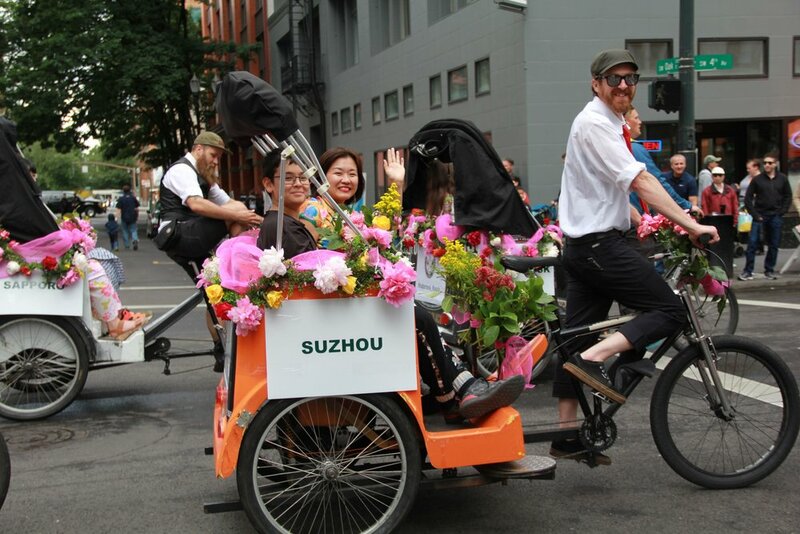 I had a great time riding in the pedi-cab representing the Suzhou-Portland Sister City Association. We (My mom and I) arrived bright and early in the morning at the meeting place (which took some effort to find) and immediately got to work, decorating our cab with bundles of bright and scented flowers. 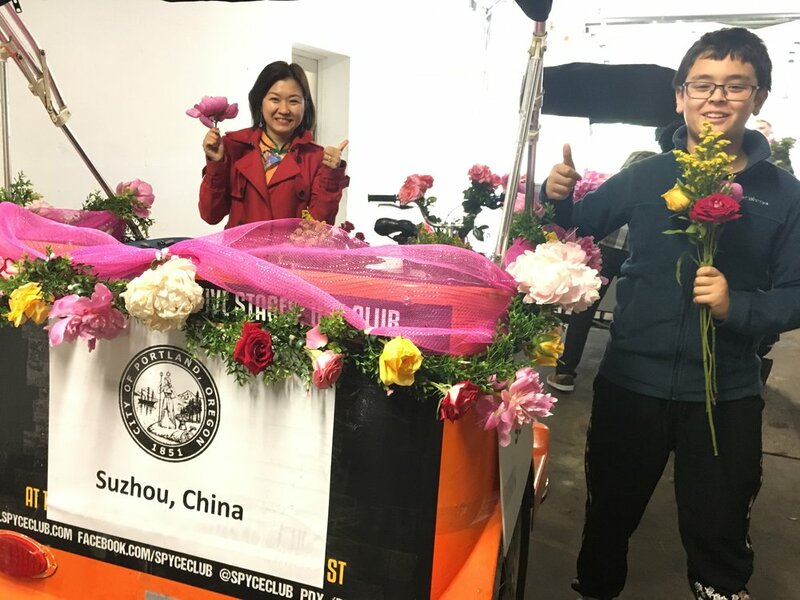 Our fellow decorators from other associations commended us on our extravagant bundles of flowers lining the bright orange cab. Finally, our group arrived at the start of the parade, and I saw just how complex, but well organized an operation this was. Horses lined the street, their riders mounted high above everyone else, sporting bright colors and intricate designs in their clothing. I also noticed the various floats that were positioned behind our ensemble of 20 or so carts. Then we started moving. I have two favorite moments from the parade; the first one was when our caravan entered the coliseum. I remember waving at the massive crowd of people lining the edges of the room, I couldn’t help but smile, taken away by the big audience and grand introduction. As our fleet exited the coliseum, I knew this would be a fun day. My other favorite moment from the parade was seeing all of the different people, from different backgrounds and a wide range of ethnicities, coming together for this event. It brought a grin to my face as we paraded down the streets smiling, waving, and our drivers cheering their heads off (figuratively). I also enjoyed seeing people’s faces light up when they recognized the various cities being represented, I heard people on the side saying things like “Oh, Oh, Suzhou! I recognize that!”. I even saw some of my classmates there. All in all, I had such an amazing time and I look forward to attending and maybe even participating next year!